We’re about 45 miles south of New York on the Manasquan River in New Jersey, so tomorrow should mark the Loop completion, and Sunday the end of the Voyage. 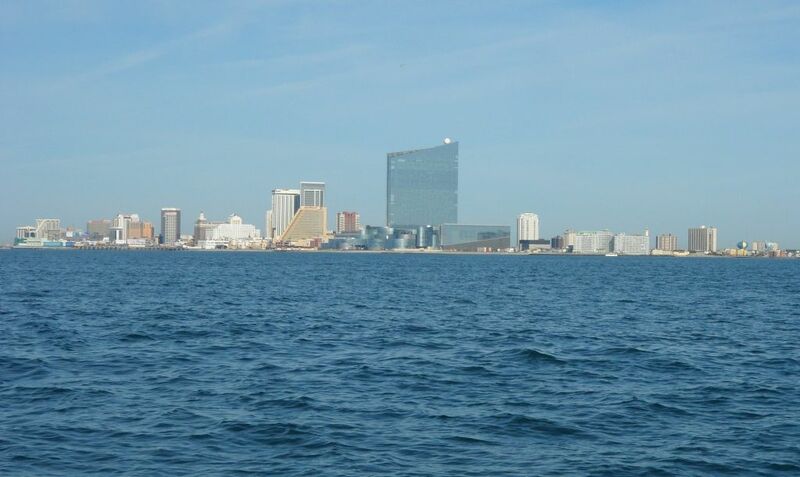 A long but uneventful trip on the ocean today from Atlantic City. I was only looking at Atlantic City as a stop to endure, not enjoy, waiting for good weather, but it turned out to be a pleasant visit. 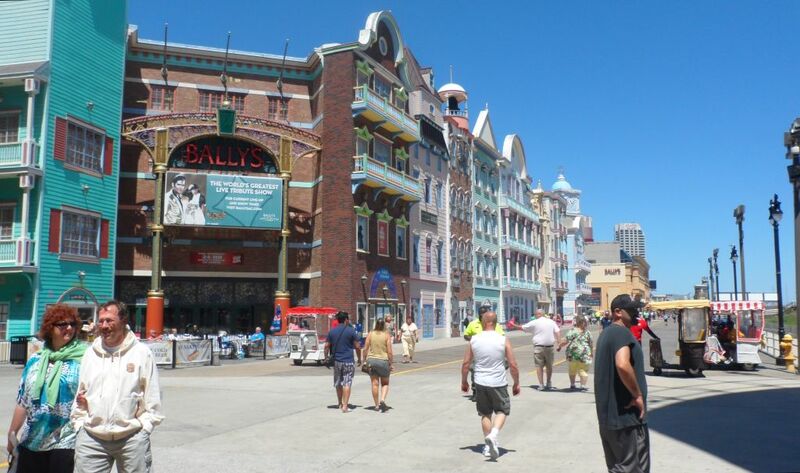 John and I took one of the very efficient jitney buses over to the Boardwalk and I was really impressed. It has been cleaned up (I guess due to the casinos) with top-flight retail stores, great beach access, food other than Nathan’s hot dogs — and mini-golf, where I beat John once again!! But the highlight was a jackpot playing video poker last night at the Golden Nugget. I was playing deuces wild, had three twos, drew two more for FIVE of a kind! Bells rang and music played and my fellow players turned their walkers and wheelchairs to congratulate me. One fellow even gave me a tip of his oxygen mask. Nothing like a free stay in a fancy marina. On the Board Walk at Atlantic City. 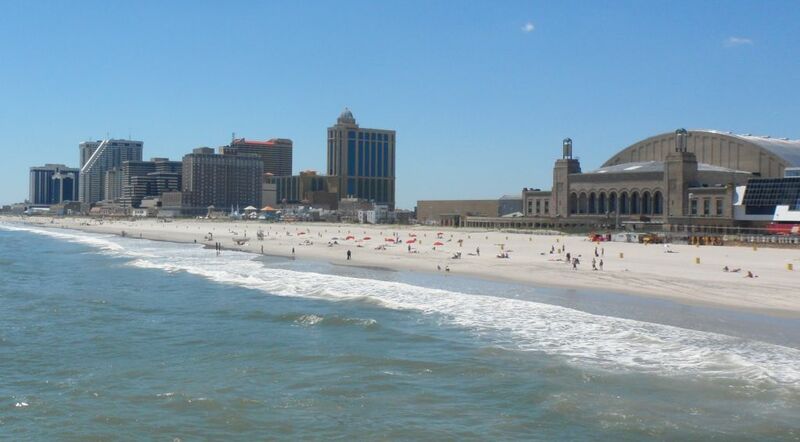 The beach at Atlantic City has always been magnificent. The big building is the Miss America venue. Can NOT believe you’re this close to finishing! Wish we could be there to catch your lines at the end and could hand you a Bloody Mary to celebrate . . . again! Loved the story of your Jersey shore experience and wonder how tomorrow, or the next day, will go for you? I felt hugely emotional as we approached the end. Glad John is positively anticipating life back in NY. Are you looking forward to being home and living on dirt instead of water? Two months later, we’re doing extremely well but still adjusting to life without “new places and new experiences every day”. Like most of life, there seem to be upsides and downsides. We’re flying to Toronto June 30 to join Loopers Mark and Allyn on “Second Wind” for a week on the Trent-Severn or Georgian Bay, wherever they are when the time comes. Fun! Congratulations and hugs to you and John when you finish. Put up a post fast so we’ll hear the news! Looking forward to your final posting. A bitttersweet moment. Please tell Molly her yoga buddy Marcia, now in land-locked central Ohio, has thoroughly enjoyed this vicarious journey. And you have read William Least Heat Moon’s RIVER HORSE, right?